Henry is 34 months old. 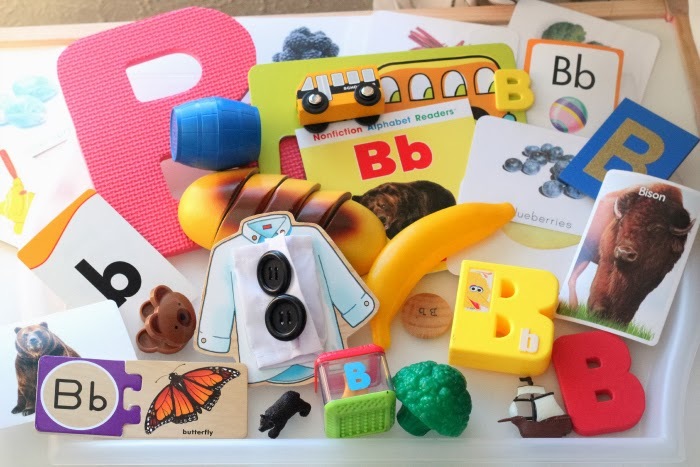 We continued exploring letters this week at tot school, and moved on to the letter B. It was a good week, although Henry was a little reluctant to spent much time working. We did go on a little staycation, which created a little too much excitement and anticipation this week. 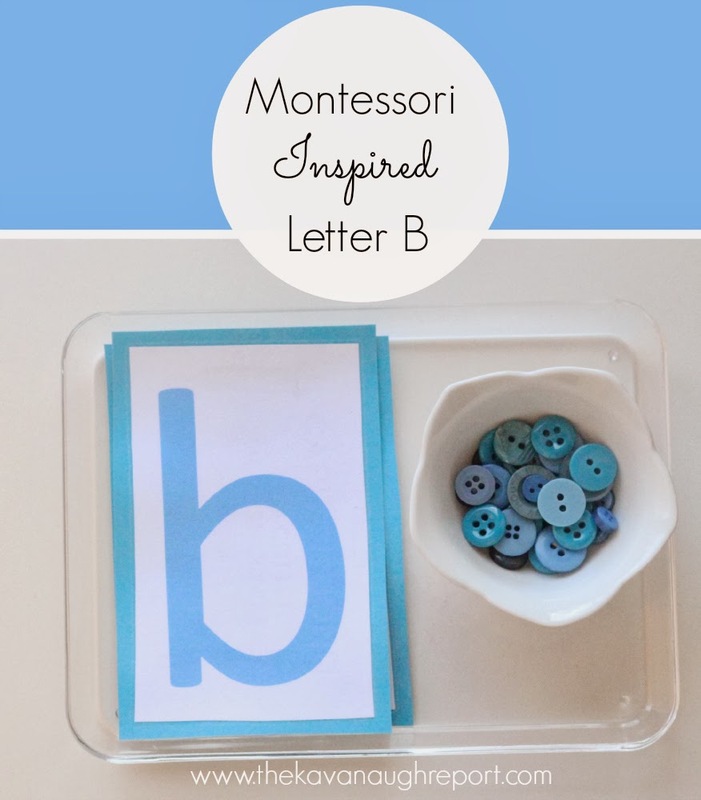 I am happy to be back to "easier" letters where we can do some fun activities. On the first tray was button pouring. 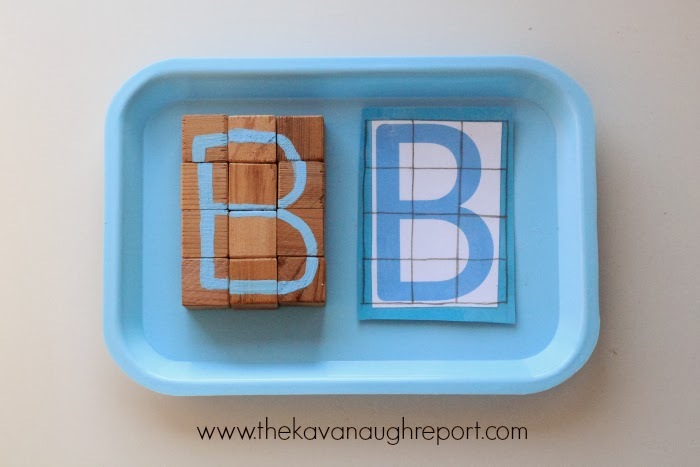 We did this tray the first time we did the letter B. At that point, Henry was much more interested in the buttons themselves. This time, he was great at pouring and really enjoyed this tray...until he spilled once. Then, he refused to use the tray again. I think we have a little perfectionist on our hands. The second tray was a little ambitious. 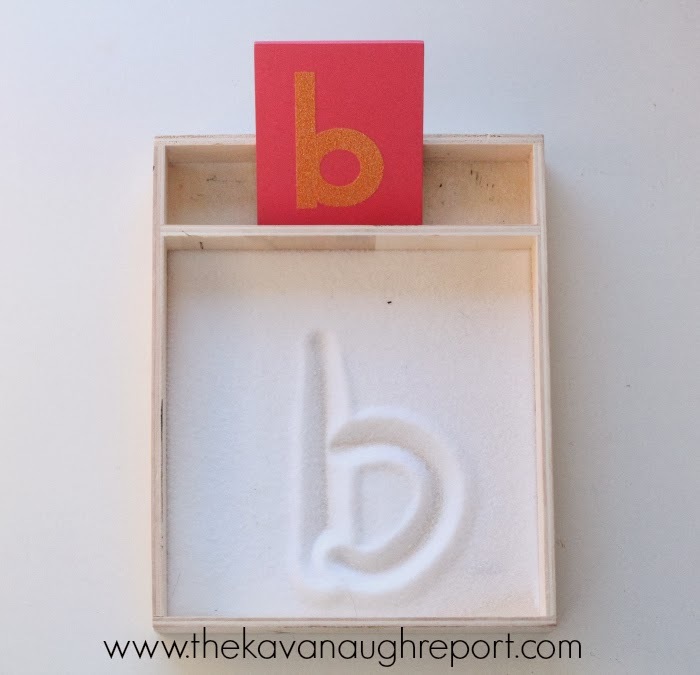 It was a set of small blocks with the letter B painted on it. The goal was for Henry to assemble to blocks to make the B. 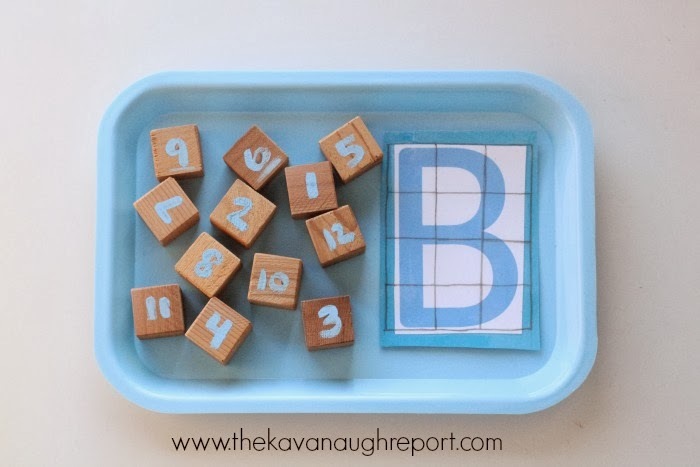 On the back of the blocks, were numbers, so that if the numbers were placed in order the B would be correct. I also included a card with the letter B and a grid to make it a little easier. This tray was too hard for Henry and for the other kids in the co-op. I knew it was a risk when I made the blocks, but it was worth a try. I think in a few months, Henry would have enjoyed this more. The third tray was a set of cards I made with the letter B and b. 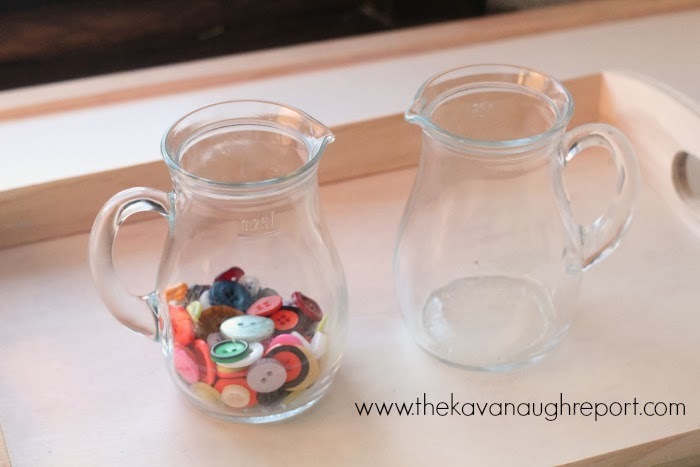 Then there was a small bowl of blue buttons. The goal was for Henry to place the buttons around the letters. Henry really enjoyed this tray and used it quite a bit. It was good fine motor and early literacy work. 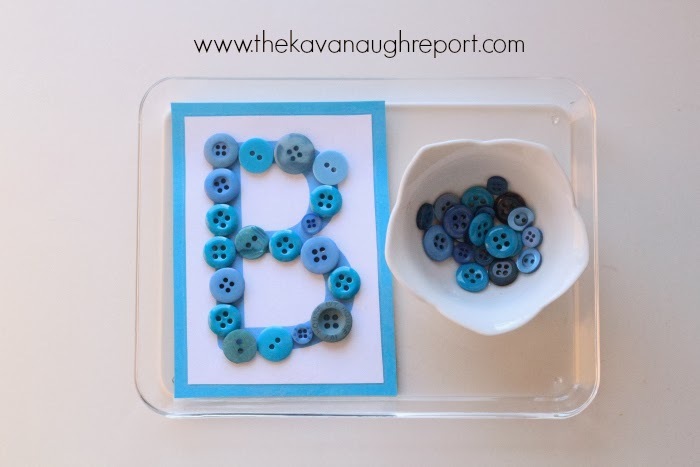 I did a fourth tray this week because there were just so many good letter B ideas. 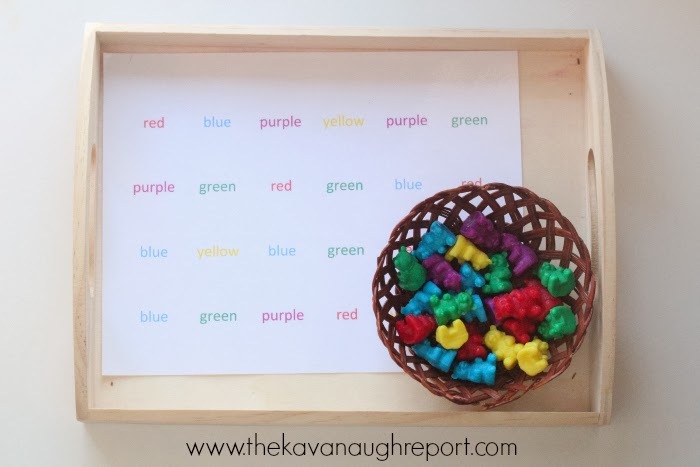 Henry has been very into color matching lately, so I used his counting bears to create a color matching tray. The idea was to match the bears to the colored words. This was a huge hit for Henry and for all of the kids at the co-op. It was used over and over. Letter B Salt Tray and Sandpaper Letter: This was still popular this week, Henry was more interested in the sandpaper letter. 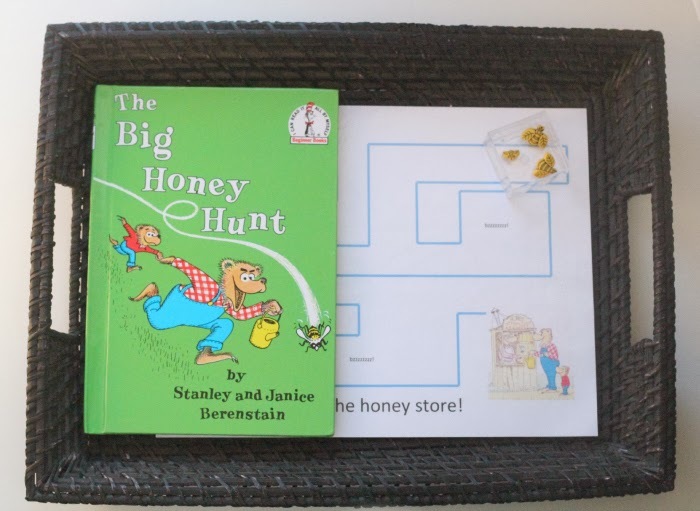 The Big Honey Hunt Literacy Tray: This Bernstein Bears book has a surprising number of B words. 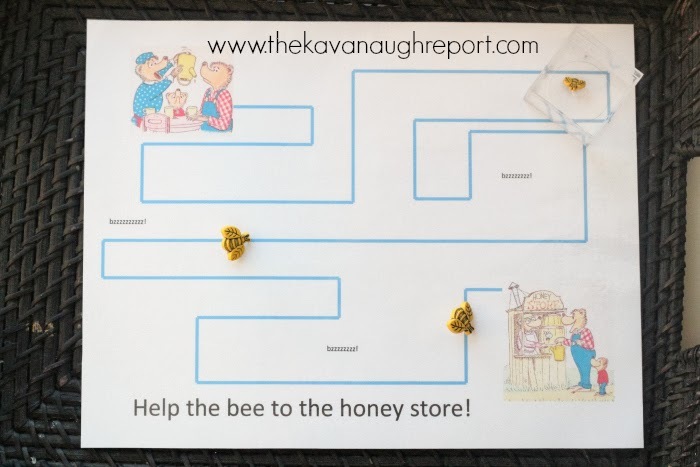 Henry loves this book and so I made a small maze for the children to follow with a little bee. I thought this would be a hit, but it was largely ignored. 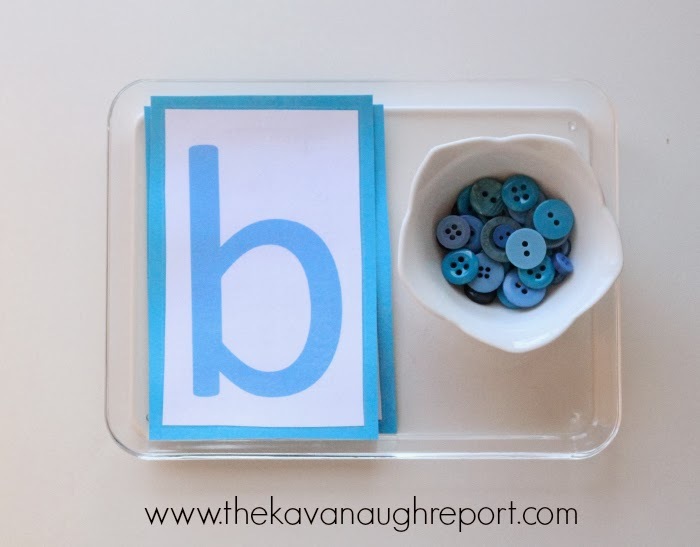 Letter B magnet tray: Henry used this a ton this week which was unusual. 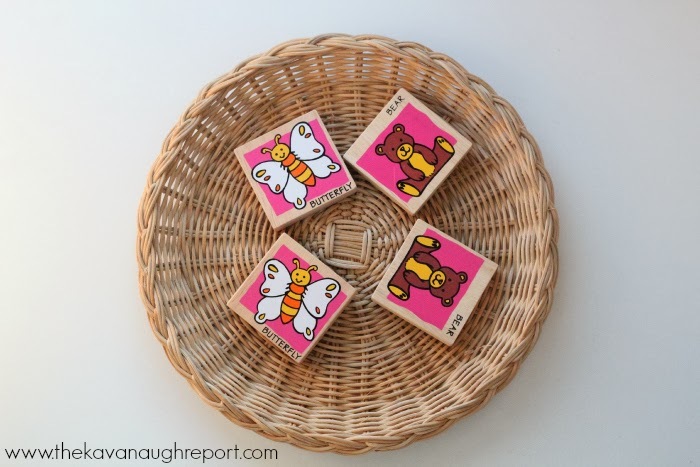 B-word Memory Matching: I used a couple wooden memory pieces with b-words. I kept it simple to introduce the concept of using your memory to match. Henry didn't use this tray, but it did get some use at the co-op. Love the B button and the colored bear matching!